What is TCP/IP reference model? We have already discussed that we need a common set of rules to communicate between different computers in the heterogeneous computer network. One such common set rule is specified in TCP/IP reference model. This is equivalent to the already discussed ISO-OSI reference model. But it has 4 layers instead of 7 layers. 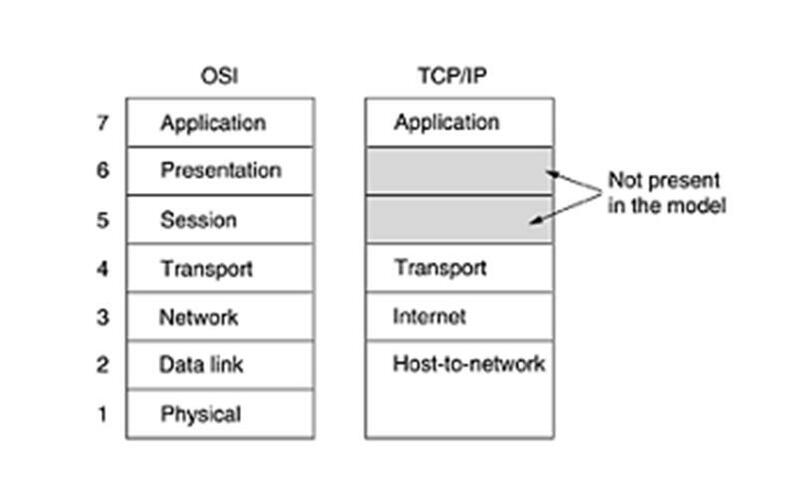 What happens in each of these layers of TCP/IP reference model? 1) Host to Netwrok Layer: The job of this layer is to transmit the packets given by the Internet layer from the Host to the network to which the Host connected. 2) Internet Layer: The job of this layer is to create the packet which is known as Datagram and route it to the proper destination. It adds a lot of control information so as to make the packet reach the correct destination. The protocol present in this layer is known as Internet Protocol (IP). IP is a connectionless protocol. Different pakcets created in this layer may not follow the same path to reach the destination. For example you want to send some packets to a Server in New York then some packets may be sent through a specific route and some packets may be sent through some other route and may not be the same route. Why is it doing this? This is because, if a specific route through which it sent the packet becomes busy then it will send the packet through some other route. Becuase of this it may so happen that the packet may not reach the destination in sequence and it will be the job of upper layer to arrange the packets in proper sequence and recreate the message. 3) Transport layer: The task of this layer is to establish the connection between the peer entities in the source and destination host. Two protocols reside in this layer one is Transmission Control Protocol (TCP) which is reliable, connection oriented protocol and the other one is the User Datagram Protocol (UDP) which is unreliable, connectionless protocol. Other function of TCP is to flow control between the slower and faster entities. TCP is also responsible for the errorless transmission of packets from source to destination. At the source TCP divides the stream of bits it receives from the upper layer and creates packets and gives it to the Internet Layer. At the destination it assembles the packets receieved in proper sequence even if the packets are received out of sequence, check for errors and if any, it is notified to the Transport layer at the source machine and the Transport Layer at the source machine resends the requested packet.